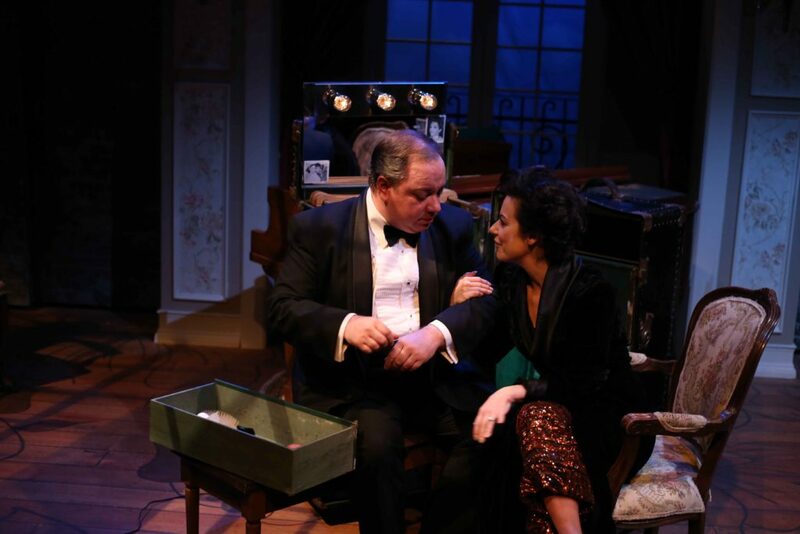 Porchlight Music Theatre presents the Chicago Premiere of END OF THE RAINBOW. I saw Judy Garland last night in this play about her final days. I experienced her as both a tragic trainwreck and a superstar diva. 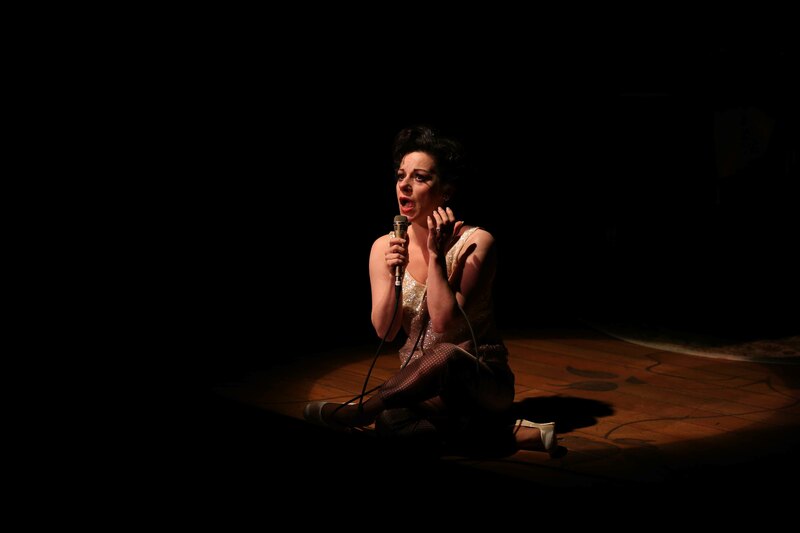 The extraordinary Angela Ingersoll (Judy) embodies the iconic legend. It’s December 1968 in London. After several major set-backs as the result of booze and pills, Judy has been booked for a 6 week run. She needs this gig to pay off debts and to re-establish herself as a world-class entertainer. 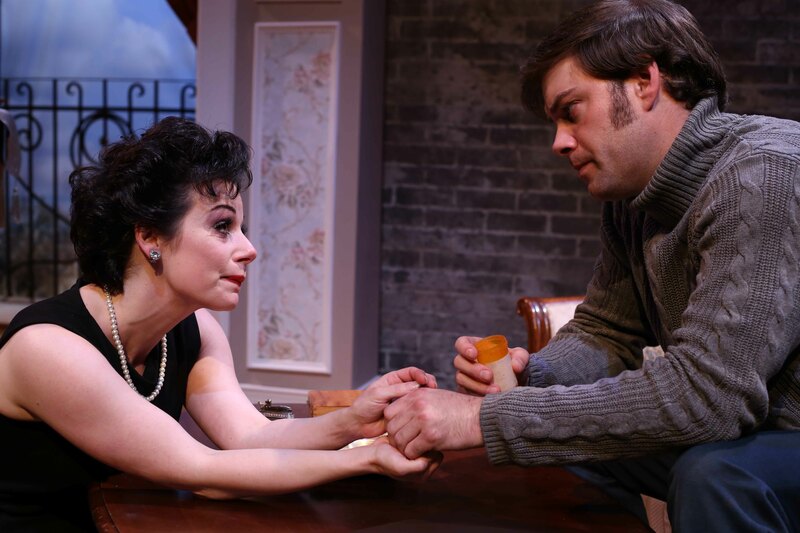 To keep her sober, she has the love of two men: her smoldering new fiance’ (played by Kyle Hatley) and her steadfast pianist (played by Jon Steinhagen). Ingersoll delivers a tour de force performance. At one point, she is full-on moxie refusing to pay her hotel bill. Next, she and Hatley are sniping or pawing at each other. Then, she’s lying in a puddle of despair begging for pills. A reluctant Hatley hands over her fix. And magically the elixir kicks in, Ingersoll steps into the spotlight and belts out a song. Ingersoll plays this role with raw intensity. She visits rock bottom multiple times. She rants. She spirals. She exposes a vulnerability from career substance abuse that started as a child. Ingersoll forces us to experience the real woman behind Dorothy. Her emotional delivery is riveting and exhausting. Still, she continually transforms into the powerhouse singer and even comes back with an encore. Although we realize no amount of red shoe clicking will prevent the destruction of Judy Garland, we hold on to hope in her interactions with Steinhagen and Hatley. Both men want to protect this fragile woman. When Ingersoll can’t get it together, Steinhagen tenderly applies make-up on her face. Later, he proposes a retirement plan to her. Hatley, on the other hand, brings down the hammer. He commands her not to drink or pop pills. Both gents are sincere in their attempts to help her which makes it even more heart-wrenching when each fails. The loyal Steinhagen is dismissed. And an exasperated Hatley succumbs to pressure. The helplessness is palpable. END OF THE RAINBOW isn’t a sequel to “Wizard of Oz.” This yellow brick road is more like a dark alley. This is a powerful tribute to an incredible singer with razor-sharp wit that couldn’t shake her addictions to drugs, booze and fame. Ingersoll’s portrayal of Judy Garland is astonishing. This show already had its final extension before it even opened. It is a must see! Running time: 2 hours and 30 minutes includes an intermission. Thursday, Nov. 17 at 1:30 p.m.
Tuesday, Dec. 6 at 7:30 p.m.
Wednesday, Dec. 7 at 1:30 p.m.
*There is no Thursday 7:30 p.m. performance November 10 and 24. All photos by Kelsey Jorissen.